Comfortable! At first think about this. You spend lots of money so you deserve this. But boats shoes are some of the most comfortable shoes. Their oiled leather is much softer than normal leather and thick rubber soles aren’t just good at keeping you from sliding on a wet deck and also provide a nice cushion so that you can comfortably stand on your feet as long as you need to. When it comes to boat shoes, you are probably going to wind up paying a little bit more for them than you would traditional shoes. However, that’s because the good ones do a whole lot more for you than traditional shoes do! But, before you go out and buy a pair, you need to make sure that you are making the most out of your hard-earned money. With a good pair of boat shoes, you don’t have to worry about slick surfaces! 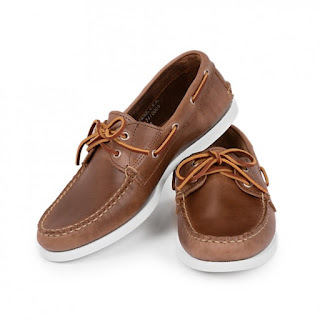 Most of boat shoes look similar to moccasins shoes. Both have the hand stitch with plug/vamp and body. Boat shoes have thick soles that will keep you from slipping and sliding. Most of boat shoes come with white rubber soles. But with these white, rubber soles, you can feel free to walk all over the place– with confidence. With white soles, what makes deck shoes different from other shoes? The shoes upper always made out of leather that has been specially-treated with oil(Oil-Pull up Leather), so that they are soft and comfortable. And, most of them are hand-sewn, which provides added comfort. I would like to mention that the hand sewing is stitched different style. Boat shoes were actually designed to combine the comfort of slip-on loafers with a traction that’s far better than traditional sneakers. However, that leather also provides a shoe that is water-resistant. These shoes also look great – because they come in a variety of colors and styles. You can get a pair of boat shoes that slip right on, or you can get a pair that looks like full-fledged sneakers . 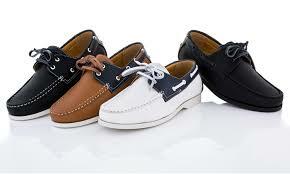 “Timberland” has the very best shoes, are top brands for boat shoes. Boat shoes offer a ton of versatility. In fact, lots of men wear them all over the place – and pair them with jeans , khakis, and shorts. The great thing about these shoes is that you can dress them up or down. You can spend the afternoon wearing them with a bathing suit and t-shirt , then pair them with some khakis and a button-down shirt for a dinner date once you’re back on dry land. To get the most out of your boat shoes, you will need to find a style that you are comfortable with, since you will likely be wearing them all over the place! Usually have leather uppers. But now a day, uppers are available in both canvas and leather in various colors and patterns. Hand-sewn (Moccasin stitch) and Top-stitched. Usually have four or six eyelets each pair. Laces are made of the same materials as the uppers especially with leather lace. Now available with conventional laces. Usually use White sole (most of them white/brown). Now also use EVA sole for low weight. Like all shoes, these shoes need to be taken care of, especially since they are often exposed to saltwater and the sun. To protect smooth leather from the elements, shine them with water-based cream shoe polish on a regular basis. It’s the stuff you find in glass jars, not tins. Avoid liquid and quick-drying polishes that contain alcohol or silicone. Keep them free of dirt, dust and salt deposits. Use a brush to do this as required. Suede boat shoes can be cleaned by sprinkling and massaging cornmeal onto the surface. Leave them overnight and then brush off the cornmeal. Use a brass bristle suede brush to realign the grain. Also can brush with a foam peace. Although some say your canvas boat shoes can be machine washed if they don’t contain any leather, I would not do it. Much better to hand wash them with soap because you may destroy inexpensive boat shoes in the washing machine. Dry your shoes at room temperature and avoid direct heat or sunlight to prevent them from drying out and developing cracks. Store them carefully, and use shoe trees to help retain their shape. Use a shoe horn to put them on and maintain the shape and structure of their backs. One last handy tip — you can remove spots using a pencil eraser and a vinegar and water solution. If you have oil or fat spots, apply rubber cement, allow it to dry and then rub it off. Again, you do it at your own risk. Yes good things. There are some of the important points which a person has to consider while making the choices. Now spring and summer style collection has a huge range of designs that offer multiple choices. The casual footwear of Aureus is very popular in USA due to its great performance, sturdy designs and quality material.